At Sonata music understand what a daunting and expensive task it can be to find quality musicians for your wedding ceremony. We believe that picking music for your wedding should be an exciting part of your planning, not an expensive chore. We offer an "a la carte" approach to enable you to customize your music to fit your personality and needs. Many couples settle on at least some of the same wedding standards. Instead of charging you hourly, making you pay the same for standard peices we know as for an hour of completely new pieces, we have compiled various package options. 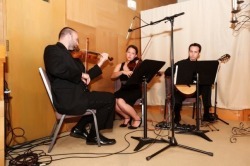 We offer many ensemble options, from a solo violin to a string quartet, guitar, clarinet, even jazz quintet! At Sonata Music we operate as a cooperative of local professionals, so whatever instruments you're looking for, just ask! We also offer transcription services so that any peice you have a recording of can be arranged and written down to be played during your ceremony. Wedding Party Music, Processional, Recessional, all peices from the Standard List (see below). 15 Minutes Prelude Music (up to 4 peices from Standard List or left to players' discretion), Wedding Party Music, Processional, Recessional, all peices from Standard List. 30 Minutes Prelude Music (up to 8 peices from Standard List or left to players' discretion), Wedding Party Music, Processional, Candle Lighting/Special Music, Recessional, all but 2 from Standard List. If you are interested in a customized package, please contact us for a quote. It would not be possible for our musicians to come fully prepared for your special day without attending your rehearsal with you. How long should the procession go? Where will I get my cue to start? Questions like these are all answered at the rehearsal to ensure that your day is perfect. One member of your hired ensemble will attend the rehearsal to answer any last minute questions you might have and prepare the ensemble for your day. Please plan on this attendance and fee. *A travel fee will apply for weddings over 50 miles. While we do our best to keep travel fees minimal, so they are also based on number of musicians and length of time invested.